Callum Wilson's 10th goal of the season and Josh King's late tap-in earned Bournemouth their first win in five Premier League matches as West Ham were beaten 2-0 at Vitality Stadium. 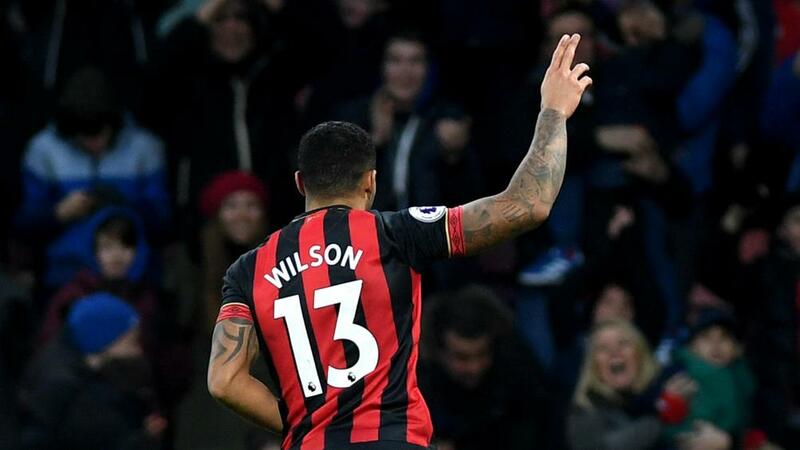 England international Wilson announced his return to action after recovering from a hamstring injury with a stunning second-half strike and King made sure in stoppage time to give Bournemouth their reward for a tireless performance against a Hammers side in good form. The defeat was only West Ham's third in their last 10 league games, but Manuel Pellegrini will have been disappointed to miss the opportunity to rise above mid-table. Bournemouth, meanwhile, were left just 10 short of the magic 40-point mark that often ensures Premier League safety after a well-deserved victory. Jefferson Lerma was Bournemouth's liveliest player in the early stages, firing over the crossbar from 20 yards in the opening exchanges and then getting caught offside when King's cross almost put him clean through on goal. The Cherries had the ball in the net when Nathan Ake bundled in Ryan Fraser's whipped cross at the far post, but the referee ruled it out for offside against Wilson, moments before Samir Nasri drilled a low shot narrowly wide from the edge of the box at the other end. Adam Smith unleashed from 20 yards shortly before the interval, but his aim was wayward and the sides went in level at the break. Lukasz Fabianski made a superb double save early in the second half, diving low to his right to parry Steve Cook's header away from goal before he stopped Pablo Zabaleta from putting through his own net moments later. Artur Boruc made a good low block to deny Andy Carroll at point-blank range as West Ham countered and Michail Antonio curled a shot over the crossbar following good work by Nasri. But West Ham's momentum was halted when Fraser burst down the left flank and sent the ball bouncing to the edge of the box where Wilson swung a hammer of a shot that bulged the net to the right of Fabianski, who stood rooted to the spot as it flashed past him. Noble dispossessed King as the forward danced into the box, but Bournemouth poured forwards again and Wilson saw his drilled effort come back off the post. The hosts had Boruc to thank for preserving their lead with a save from Javier Hernandez late in the game. And on the stroke of 90 minutes, Junior Stanislas broke down the right and fed David Brooks who strode into the box before squaring to King and the striker side-footed into an empty net with Fabianski stranded to make sure of the win. A run of only one win in their previous seven Premier League games saw Bournemouth slide down the table, but taking three points against a West Ham team who beat Arsenal a week earlier will have delighted Cherries boss Eddie Howe. While Wilson's strike will grab the headlines, Ake almost opened the scoring when his first-half effort was disallowed and he was superb at the back all afternoon to frustrate Hammers forward Carroll. Aside from his low shot in the first half, Nasri offered precious little in attack and was hauled off after 65 minutes having failed to provide West Ham with the creativity and guile that Marko Arnautovic normally delivers. Bournemouth have a 10-day rest period before they entertain Chelsea in the Premier League while West Ham will hope to avoid an upset when they travel to AFC Wimbledon in the fourth round of the FA Cup.